On Tuesday, Mr. Hammond seemed to emerge the victor in one battle, securing cabinet support for the soft transition from membership of the customs union. Introducing the plan, David Davis, Britain’s main Brexit negotiator, noted that other European Union nations, which export more goods to Britain than it sends back, have an interest in making it work. Under the proposal, Britain would quit the customs union, but seek to join something almost identical for a period. During that time, it would want to be allowed to sign — but not put into effect — trade deals with other partners. That stipulation — like everything else — has to be agreed upon with the other 27 European governments, which may oppose such a move. And experts say that countries like the United States or India would not be in a position to strike trade deals with Britain until they know more about its future economic relationship with the European Union. In any event, the British plan was given a cool reception by European Union officials, who said there would be no negotiations on that point until “divorce” issues have been settled, like the exit bill London would have to pay and the rights European Union citizens in Britain would have. Hence, the talk about “fantasy” from Mr. Verhofstadt. More important, the lack of any convincing scheme for the longer term underscores the unresolved divisions in the government over whether Britain should gamble with its ties to the giant European economic free trade area on its doorstep in the hope of negotiating separate agreements that would limit the damage from leaving the customs union, in part or even entirely. 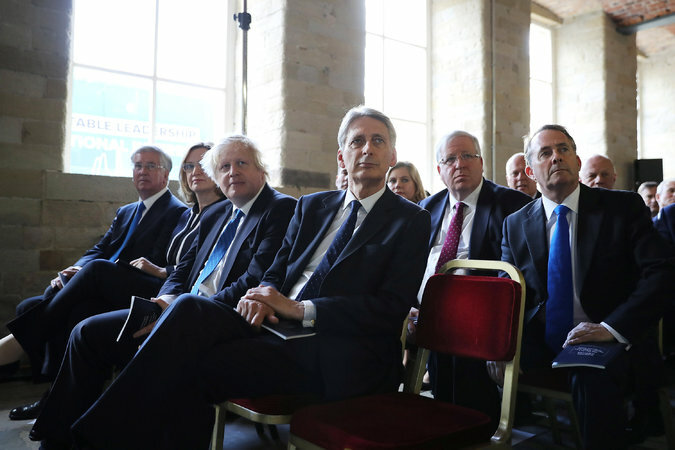 The British chancellor of the Exchequer, Philip Hammond, center, is pushing to prioritize the interests of the economy while his adversaries, including Foreign Secretary Boris Johnson, third from left, are eager to sever ties with the E.U. The infighting has been heightened by the economic uncertainty caused by Brexit, with reduced investment in key British industrial sectors, subdued economic growth and a decline in living standards as business frets about a “cliff edge” change in trading rules ahead of Britain’s planned departure in 2019. The tensions burst into public view last week when James Chapman, a former senior aide to Mr. Davis, described Brexit as a catastrophe, called for the creation of a new political party called the Democrats to oppose it, and suggested that the foreign secretary, Boris Johnson, and other Brexit campaigners should be jailed for false claims made ahead of last year’s referendum (in which Britons voted 52 percent to 48 percent to leave). “Let’s be honest, if we had an effective electoral law leading Brexiteers would now be in jail #wheresmy350maweekboris,” Mr. Chapman tweeted, a reference to Mr. Johnson’s claims that an additional 350 million pounds a week — $525 million at the currency rates then prevailing — would be available for health care after Britain’s withdrawal. Supporters of Brexit fought back, including Jacob Rees-Mogg, a Conservative lawmaker, who argued that Mr. Chapman wanted to overturn the will of the people, and said that rather than the Democrats, his party should more accurately be called the Oligarchs. Meanwhile, what Britain wants from long-term Brexit trade negotiations — let alone what it can get — seems almost as opaque as ever, with Tuesday’s document suggesting two strikingly different options. One would allow for very different British and European Union customs systems, but rely on technology to prevent trucks backing up at ports — a challenge for which Britain and its neighbors would certainly need to prepare. The second, “partnership” approach would align some British and European Union rules, doing away with any customs border between Britain and the European Union at all, as at present. The British government acknowledged that it would be “challenging” to do this in a way that was compatible with Britain’s desire to strike broader global trade deals. “These fantastical and contradictory proposals provide no guidance for negotiators or certainty for businesses,” Mr. Starmer said in a statement. Though Mr. Davis insisted that discussions in Brussels were going well, even he made little attempt to conceal the scale of the task ahead when asked about the pace of talks. “This is probably the most complex negotiation in history,” he told the BBC.